Kate del Castillo in 2015 in Miami, Florida, left, and Joaquin "El Chapo" Guzman in 1993, right. Mexican actress Kate Del Castillo wants Mexico's government to drop accusations of obstruction of justice and money laundering related to her meeting last year with drug lord Joaquin "El Chapo" Guzman. Del Castillo's representatives said in a statement Tuesday that the actress has filed papers seeking a court injunction demanding prosecutors "either charge her with a crime or close the criminal investigation." 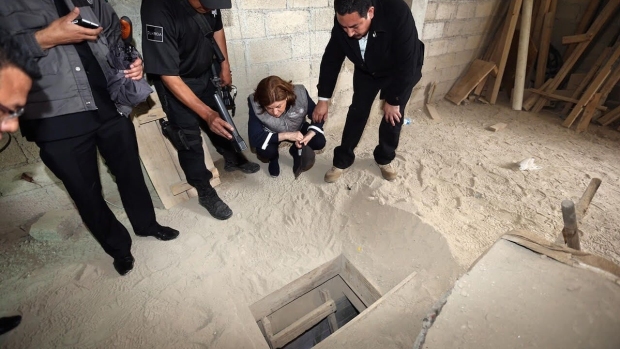 "The Mexican Attorney General's office has constantly violated her rights to due process by leaking information of the investigation to the media, and violating her presumption of innocence," the statement said. Mexican media published a series of seemingly flirtatious text messages between her and Guzman that were leaked earlier this year. Mexican authorities have said they are investigating possible money-laundering involving Guzman and del Castillo's tequila business and have sought to question the actress. They have said she is considered a witness, and she has not been charged with any crime. A kind of summons for del Castillo to be questioned has been issued, but the naturalized U.S. citizen has remained in Los Angeles, where she lives. Her lawyer in the United States says she has nothing to hide and is willing to talk to Mexican authorities. Del Castillo arranged actor Sean Penn's interview with Guzman in October while the Sinaloa cartel leader was on the lam after his second prison escape. Guzman was recaptured in January. The actress' representatives said she will continue with plans to make a movie about him. "Kate has consistently made clear that her only goal was to produce an artistic and journalistic project of Guzman's life story and turn it into a compelling and informative film project that would help Mexicans and Americans understand the deadly business of the drug cartels," said the statement from Capitol Media Partners, a Los Angeles-based communications and public affairs firm. "Regardless of what comes next, Kate is committed to completing the film project for which she has already committed so much of her time," the statement said. The wife of Mexican drug lord Joaquin "El Chapo" Guzmán, Emma Coronel Aispuro, likened her husband's treatment by prison guards to "slow torture."